In times of stress and frustration, as is the case for me at election time, I look for ways to find calm in chaos, hope in despair and empowerment in oppression. 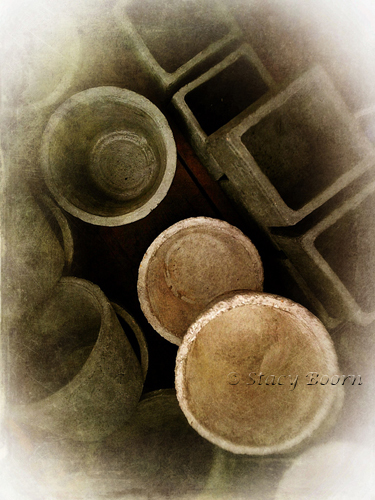 The images that I created this week I refer to as “orderly disorder.” In both the fallen acorns and plant pots I didn’t find an organized pattern on-site. But the objects were not in total chaotic disarray. So in both cases I saw beauty in their repeated colors and shapes and then moved them around a little bit to get them into positions that provided a less static presentation. This week the phrase “harvest child” from poet Sherri-Rose Walker was bouncing around in my head. These images are my harvest-child offerings to you, for calm and hope, as we approach elections and the possible calamity of epic super-storms and war from many directions. May the actions we take in them provide for renewed hope and empowerment, especially for women! Yes, especially for women because when the world is a better place for women it is a better place for us all. When the economy is better for women it is better for all. When health care is available and affordable to all women it is a healthy world for us all. The acorns were scattered on the ground at Mt. Tamalpais State Park, CA. I had gone there in hopes of getting a grand vista but the fog was so thick that you could barely see the tree shapes 20 feet in front of you. This kind of lighting is wonderful though for colorful objects. Mount your camera on a tripod so that you can use a small aperture to achieve your desired depth-of-field (here f/16). Remember, when photographing objects very close you have a very shallow depth-of-field so be sure to use the highest f-stop possible (i.e. f/16, f/22, f/32). In post-processing I applied a “grunge” filter to give the appearance of scratches and then blurred the edges. Think of creating monochrome images with color capture. I don’t mean changing the image to gray scale or de-saturation in Photoshop or other programs. I mean find your subjects basically that way and use your in-camera skills! 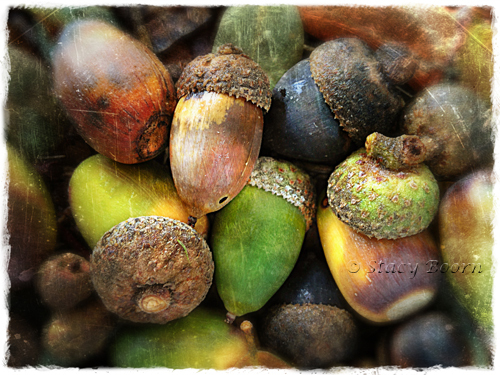 This entry was posted in Weekly 2 and tagged Acorns, creative photography. Bookmark the permalink.